Mash the boiled potato well. Now in a bowl put together 4 chopped Green chilies, 1 tsp. Black pepper, 1 tsp. Cumin seeds, 1/2 tsp. Crushed red chili, 1/2 tsp. Salt, 2 tbsp. Cheddar cheese, 2 tbsp. Mozzarella cheese and 2 tbsp. Mint leaves. Mix well. Flatten the Bread slices using rolling pin. Fill the mixture in bread slices and fold like a Swiss roll. Dip in 2 beaten egg, roll in 1 cup Flour and fry in hot oil. 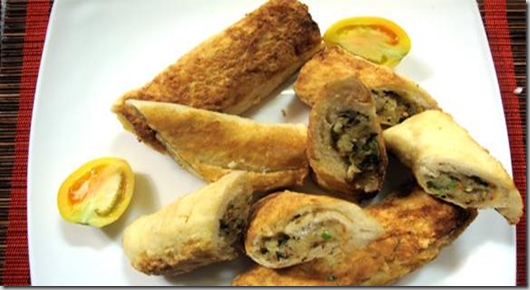 Delicious and crispy cheese rolls are ready to serve.